In this interview, Dr. Rich Jones introduces bacterial cell counting and an example of when the Multisizer 4e from Beckman Coulter has been used for this application. What are the main applications of bacterial cell counting and sizing? Two application areas seeing a major surge for the multisizer are in environmental research and for optimization of recombinant protein expression in the lab. An example of the former is work published last year by researchers at the University of Aalborg in Denmark. They used the Multisizer 4e instrument to count and size pathogenic E. coli and to study the ability of another environmental organism D. magna to reduce this pathogenic E. coli strain in the environment. Similarly, researchers at the University of Groningen used the Multisizer to count the oceanic microbe E. huxleyi. E huxleyi is an important producer of dimethylsulfide and the team used the MS4e to standardized microbial titers and subsequently to investigate the influence of CO2 levels on dimethylsulfide (DMS) gas. Closer to home, researchers at the Coastal Studies Center in Brunswick, ME have used the Multisizer to monitor laboratory growth of F. cylindrus. In this case the group was studying the influence of salt on the production a DMS (precursor). Back in the old days, bacterial concentrations were typically assessed by measuring optical density which provided quite a crude assessment of concentration. Alternatively, microbiologists might have performed a serial dilution of bacterial cultures and then transferred these to Petri dishes in order to have a more accurate determination of cell counts. Unfortunately, many microbial types are not easily cultured in the laboratory in plates. Environmental microbes often live in communities and cannot be cultured by themselves. In such cases, the Multisizer is a lifesaver. Because it simultaneously counts and sizes each individual microbe, one-by-one, the researcher can track the influence of environmental perturbations such as pH, gasses, sampling source, etc. on the size and proliferation rate of bacteria and have a better understanding of how these variables may influence microbial communities and the environment as a whole. Because of the exquisite ability of the Multisizer 4e to size and count cells, it has been used by many groups to optimize conditions for producing recombinant proteins. In order for mammalian, insect, or bacteria cells to express high amounts of protein they must proliferate, but they must also grow and be maintained at an optimal size. Researchers at the University of Brisbane used the MS4e to study the relationship of cell size, and density with baculovirus production levels in insect cells. How have advances in coulter counter technology impacted these applications? Several aperture tubes of different size ranges are available for the instrument. Each aperture tube is able to measure particle sizes ranging from 2 to 80% of the aperture tube diameter. For example the newest aperture tube with a 10 micron diameter can measure particles from .2 micron to 8 micron; on the other end of the size range, the 2000 micron aperture is able to size particles from 40 to 1600 microns. Can you please give an overview of the Multisizer 4e from Beckman Coulter? The Multisizer 4e represents the latest in a long series of cell and particle analysers originally developed by Wallace Coulter in the 1940s. Similarly as in the original analyser, the MS4e counts particles using a glass “aperture” tube that contains a small orifice through which particles pass, termed an aperture. On each side of the orifice are electrodes that apply an electrical potential. In the absence of particles, a low impedance is measured across the orifice. Upon application of a vacuum, particles are pulled through the aperture orifice which results in electrical pulses that are proportional to the volume of electrolyte displaced. The instrument measures particle volume which is a cubed function of the radius. Small changes in cell volume therefore result in large changes in electrical conductivity. The MS4e is therefore much more sensitive than image-based instruments at monitoring cell size. Because it operates on the principal of volume displacement, it doesn’t require staining of particles. They can be invisible to light but still result in a measurable signal by the instrument. How does the Multisizer 4e differ from previous versions and what impact has this had on the applications in research? The Multisizer 4e offers a variety of improvements over the previous version known as the Multisizer 4. Firstly, the Multisizer 4e has greater range, is now offered with a 10 micron aperture tube extending the lower range down to .2 micron. This has resulted in a dramatic increase in microbial and virus titering applications in the basic research laboratory as well as in quality control laboratories. Can you please explain how the Multisizer was recently used by Kirkitadze et al. in a biopharma QC environment? Marina Kirkitadze and her colleagues at Sanofi Pasteur recently used the Mutisizer instrument to assess the manufacturing consistency of Bacillus of Calmette and Guerrin (BCG) immunotherapeutic. Although they previously used a laser diffraction instrument for quality control purposes, they found that the Multisizer had several important advantages for them. The Multisizer design allowed samples to be measured in a confined chamber that prevented biohazardous aerosol release. This was in contrast to their laser diffraction instrument which was not able to prevent the production of aerosols and the potential exposure of quality personnel to biohazardous material. The Multisizer required much lower diluent than their previously used laser diffraction instrument and they found that fewer cleaning steps were required with the Multisizer because of its use of IsotonII electrolyte solution which prevented adsorption of their material. In contrast to their previously used laser diffraction instrument, the Multisizer was able to measure both particle size and count. Using the 280 and the 1000 micron apertures, the team was able to monitor the relevant size range of their particles. Using the Multisizer the group was able to assess both the BCG size distribution of several production lots (expressed as d10, d50, and d90) as well as the concentration. The polydispersity was analysed across 20 lots of material. The group qualified the instrument to support comparability studies. They have plans to use the instrument to assess the impact of process change on product quality attributes. In summary, this was an elegant report that described enhanced safety, increased productivity, and greater control of production process that was afforded by the advantages of the Multisizer instrument. What feedback have you received from Multisizer users? Over the past several months, I have spoken with dozens of Multisizer users. Several common themes have emerged from the conversations. The Multisizer is in a league of its own when it comes to applications that require either the counting or the high resolution sizing of particles in the 200 nm - 1600 micron size range. The Multisizer is often used to calibrate or verify the size and/or particle counting accuracy of other instruments such as flow cytometery, laser diffraction, light scattering or size exclusion HPLCs. At one of my recent visits to a manufacturer of diagnostic kits employing gel resin, the quality director indicated that the multisizer had saved his company about 10 million dollars. A quality check with the multisizer revealed subtle changes in the size distribution of gel beads from a supplier. This change in distribution triggered an investigation that revealed a change in process by their supplier. Had the user not been checking the sizing distribution of their beads with the multisizer, the quality of their kits would have been in jeopardy and tracking down the source of the changes in kit performance would have been much more tedious, and costly. In what ways does the Multisizer differ from other products on the market? Because the Multisizer instruments employ the Coulter (also known as electrical sensing zone) principle, they provide a view of particles that is orthogonal to many other light-based methods and an added level of risk mitigation for quality control of processes and products. The Multisizer does not require labelling of particles, and does not rely on the refractive index properties of particles. 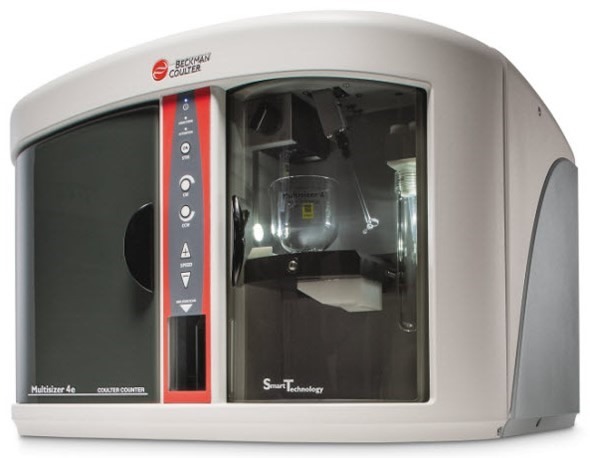 Lastly, the Multisizer simultaneously counts and sizes each particle, one-at-a-time within the sample, and does it very quickly. Unlike ensemble approaches such as DLS and laser diffraction, the Multisizer instruments can detect single outlier particles throughout the size analysis range of an experiment. What do you think the future holds for bacterial cell counting? As more scientists, engineers, and quality personnel become aware of the advantages of the Multisizer 4e and its extended range, I envision dramatic expansion in the following areas. What is Beckman Coulter’s vision for cell counting and what advances are in the pipeline? For over 80 years Beckman Coulter has been at the forefront of Cell Counting and Cellular Analysis innovation. Today Cellular Research continues to expand at a furious pace and we have entered the era of Cell Engineering for the production of drugs and Cell-based Therapies for the treatment of diseases. Beckman Coulter is committed to providing our customers with innovative tools to meet their cellular analysis needs by delivering the technologies, answers and solutions they seek. 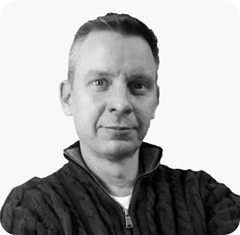 Dr. Jones has a long-standing interest in the development and application of automated protein analysis technologies and workflows for interrogating protein systems in human biology and pharmacology. He has over 20 years of experience in the field of protein and cell biotechnology. While an Assistant Professor in the Ben May Department for Cancer Research at the University of Chicago, Dr. Jones developed micro-western arrays for studying the responses of cancer cells to therapeutics and for understanding chemotherapeutic resistance mechanisms. In addition to being an Assistant Professor, he was a Core Fellow and founding member of the Institute for Genomics and Systems Biology and was founder and director of the University of Chicago Micro-western array Protein Analysis Core Facility. He trained at Harvard University as a Kirchstein honorary Postdoctoral Research and Teaching Fellow where he participated in the development of protein microarray approaches for mapping human protein interaction networks in breast cancer.